Published By – Andrew Heath Music Ltd. Marketed By – WEA Records Ltd.
Standard solid center 'Beggars Banquet' black-on-red paper label. 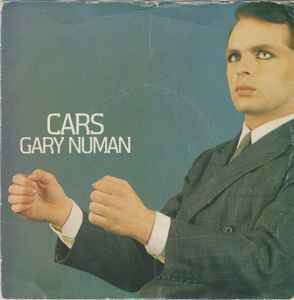 This version has the production credits for Gary Numan on the labels, at the 6 O'clock position, unlike Cars. Exactly the same as Cars & Cars, except for the differences in matrix & no Eddy Gorecki (E.G.) credit. or the silver pressed label, that is etched BEG 23 A5, and was pressed in France. Beggars Banquet / Andrew Heath Music Ltd. Marketed By WEA Records Ltd.
Track A: Taken from the L.P. BEGA 10 The Pleasure Principle. Distributed by WEA Records Ltd. A Warner Communications Company. Country of manufacture of record as stated on the record label. © 1979 A Beggars Banquet Recording.